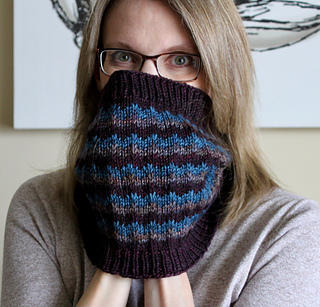 The deep colours used in this cowl create a moody feeling, expressing perfectly how many of us feel after several months of a cold dark winter. 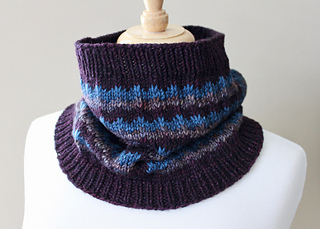 Choose any three colours of worsted weight yarn for your Moody Cowl to express your winter feelings. 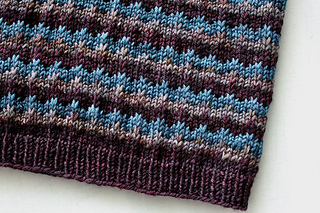 The slipped stitch colourwork pattern is easy to work. The slipped stitches create a dense fabric and the yarn carried along the inside adds extra thickness making it cozy and warm. 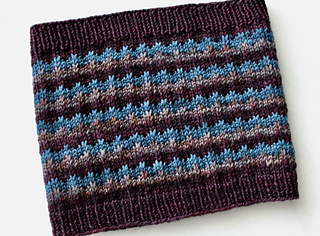 This cowl is worked in the round from the bottom up. Instructions are written. This pattern is written for three colours of Black Cat Custom Yarn Let’s Get Worsted: 1 skein C1, or approx 130 yd/70 g; 1 skein C2, or approx 55 yd/30 g; 1 skein C3, or approx 55 yd/30 g. Shown in Void Talon (C1), Foundry (C2), and In The Navy (C3). Finished Measurements: Approximately 9.5 inches (24 cm) tall and 11 inches (28 cm) wide laid flat, after blocking. Total circumference is approximately 22 inches (56 cm). 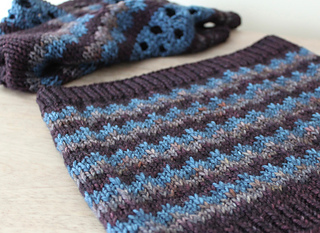 Skills required: Working in the round, changing colours for stripes, slipping stitches. Stitches used: k, p, sl. 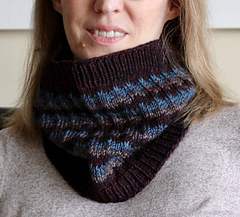 See also: the Moody Shawl pattern.